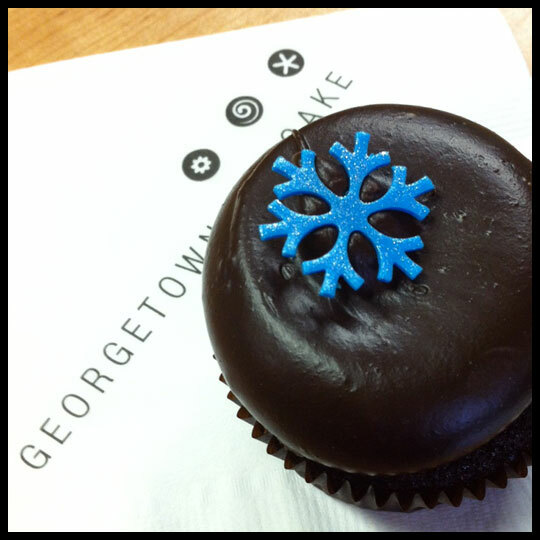 Recently, we’ve been surprised TWICE with cupcakes from Georgetown Cupcake. 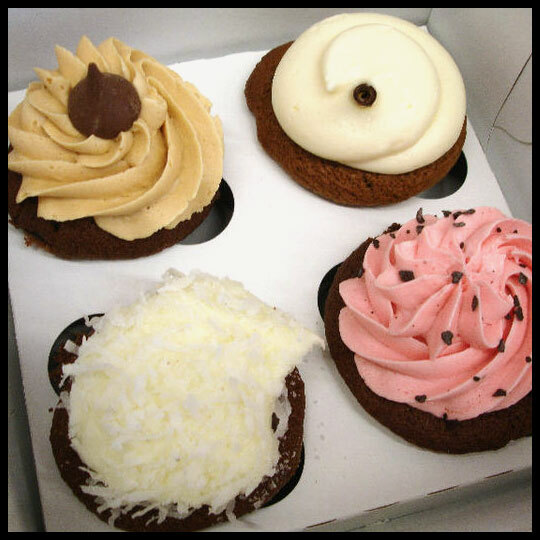 Being a Cupcake Crusader definitely has its perks! 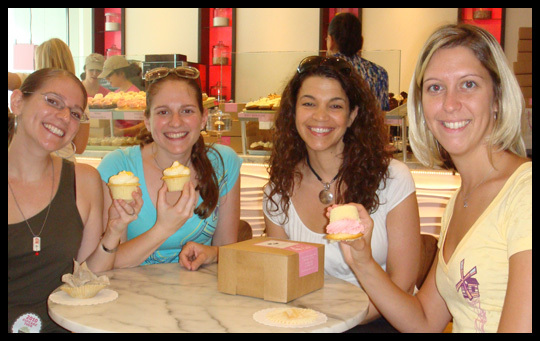 The first set of cupcakes, reviewed by Crusader Elisa, were from her good friend, Laura. Because of Laura, we were lucky enough to taste the brand new New York City flavors! 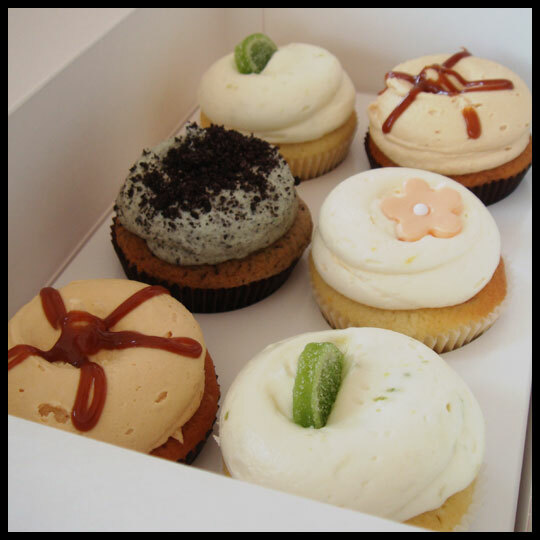 The second set of cupcakes, reviewed by Crusader Stacy, were a surprise from her boss who had meetings scheduled in DC. 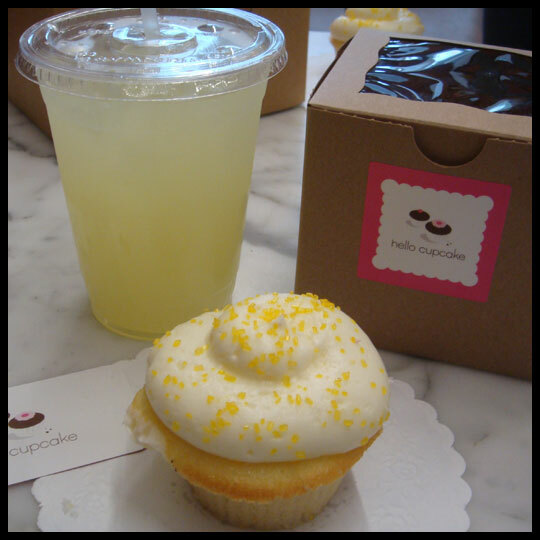 Both were great unexpected treats and we are happy to share our reviews of the cupcakes here! NYC cupcakes in DC! Or is it DC Cupcakes in NYC?! People had to have been cheering on Feb 11, 2012 all over NYC, because Georgetown Cupcake opened their doors on 111 Mercer Street in Soho. While the crusaders have loved Georgetown’s DC (and now Bethesda) location for years, our NYC friends have had to make the the journey to the DC area or be content with our write ups about them – until now! While this might not be your traditional “cupcake,” because it was basically its own little mini cheesecake, it has all the flavor of a NYC cheesecake, with that special hint of citrus that makes NYC cheesecake stand out from all the rest. 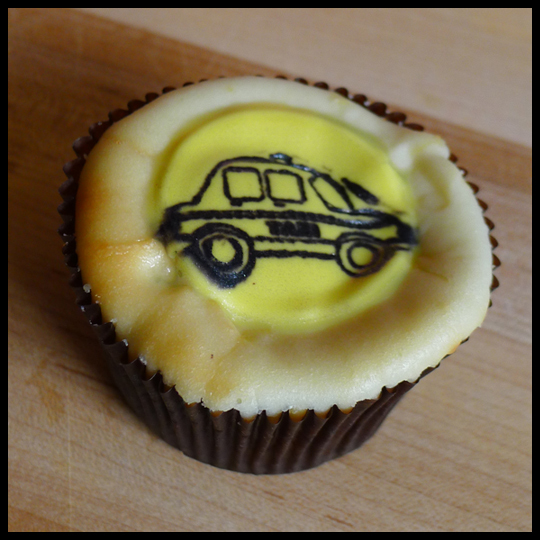 The taxi cab fondant topper was not only adorable, but tasty! And no one can deny the fantastic-ness that is buttery graham cracker crust! These cookies are more like cake for me and are always something I drool over when I am in NYC. 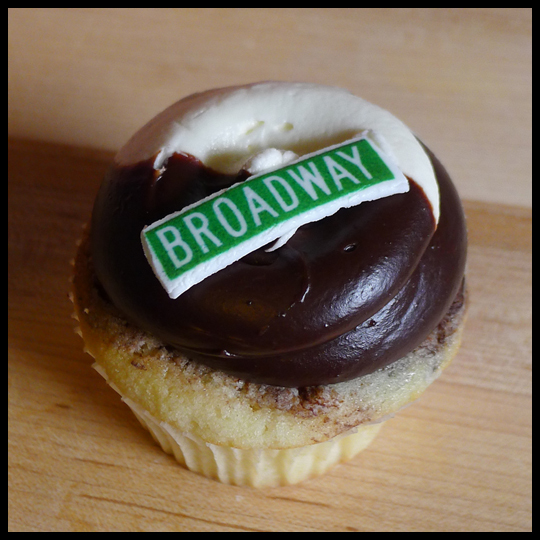 This cupcake is just as drool worthy! The mix of vanilla and chocolate frosting was sweet and decadent. 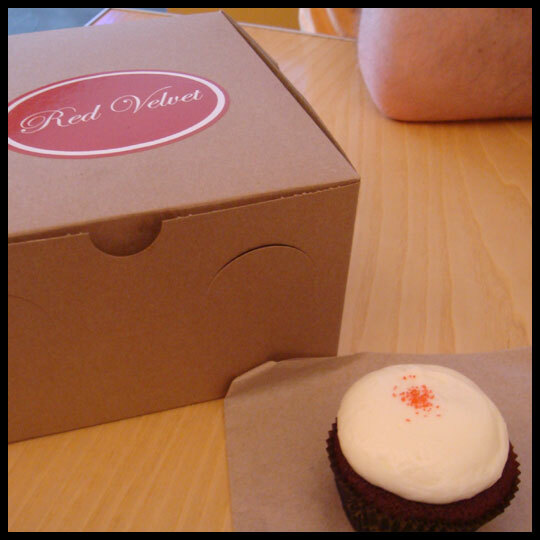 The cake was tasty and moist, all around, this is a cupcake I’d like to see make itself a spot on the permanent menu in DC! 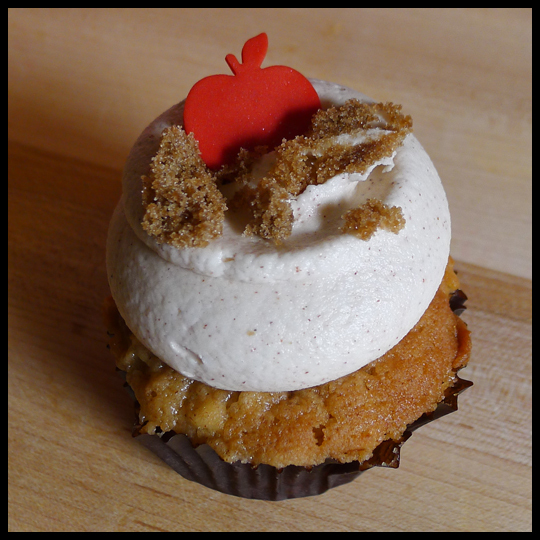 By far the BEST apple cupcake I have ever eaten. The cake was full of apple pieces and was moist and buttery. The icing was a cinnamon and buttercream explosion of flavor, with brown sugar on top that created the flavor and texture of the “crumble” topping my mom puts on top of her apple pies. Even the fondant apple decoration was cinnamon flavored! I would pay very good money to have this cupcake again, and again, and again. Just a little while ago my boss came into the office with a dozen cupcakes from Georgetown Cupcake’s DC location. I would have been perfectly happy taking all twelve flavors home with me, but being the kind co-worker I try to be, I shared with the office. (Okay, maybe I didn’t have much of a choice, but I PROMISE I would have shared if I did). Luckily the office is small, so I got to have three flavors all to myself. I have never tried the classic flavors from Georgetown, so I decided this would be a good opportunity and selected a Chocolate2, a Vanilla Birthday, and one fun flavor – Coconut. 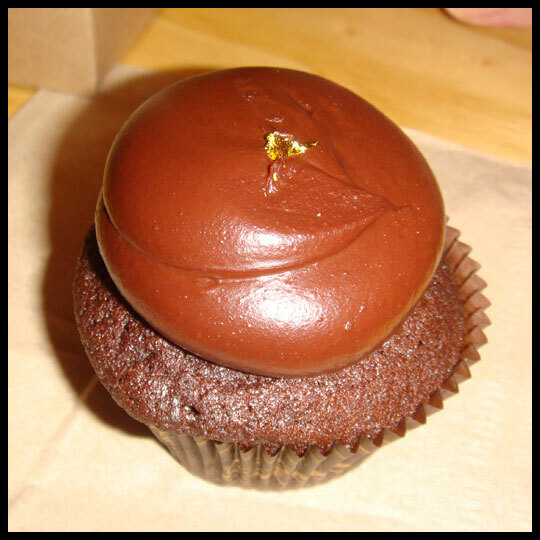 This cupcake with Valrhona chocolate cake and a whipped Callebaut chocolate frosting was any chocolate lover’s dream. While the cake was a bit crumbly, the frosting easily made up for it with its rich, creamy, and decadent wonderfulness. Normally I wouldn’t get a cupcake again if the cake wasn’t really nice and moist, but the frosting on this is worth every penny. 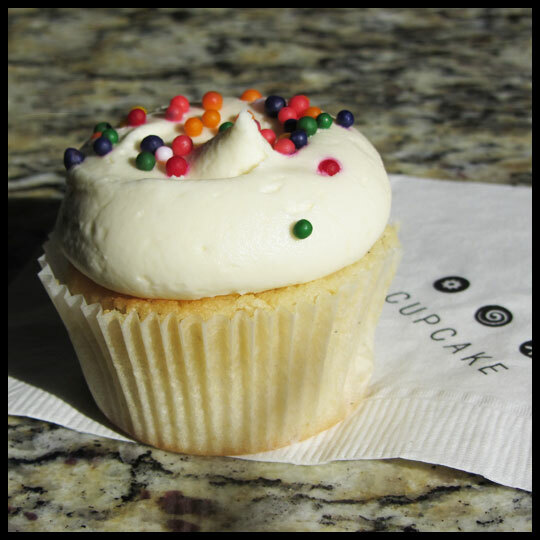 Although this cupcake with Madagascar bourbon vanilla cake and a sweet vanilla buttercream frosting wasn’t the best vanilla I’ve ever had, it was still pleasant. 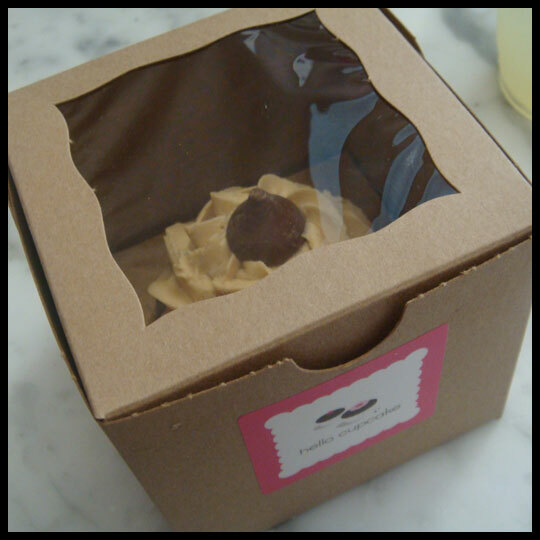 It was light and smooth, a classic that any cupcake lover would enjoy. The best part was the rainbow sprinkles. These aren’t any normal sprinkles, they have a fruity candy flavor that matches the “birthday” part of their name. 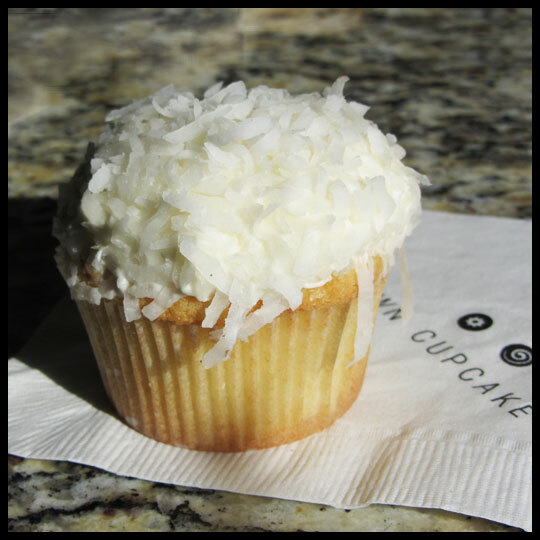 I’m a big fan of coconut anything and this cupcake lived up to all my hopes. The cake was filled with coconut shavings and packed with flavor. The vanilla cream cheese frosting balanced it all out and stayed in the background, letting the coconut really shine. The abundance of coconut shavings on top might seem like a bit much, but it only sealed the deal for me. I think this might actually be one of my new favorites (along with the NYC flavors Elisa reviewed above). 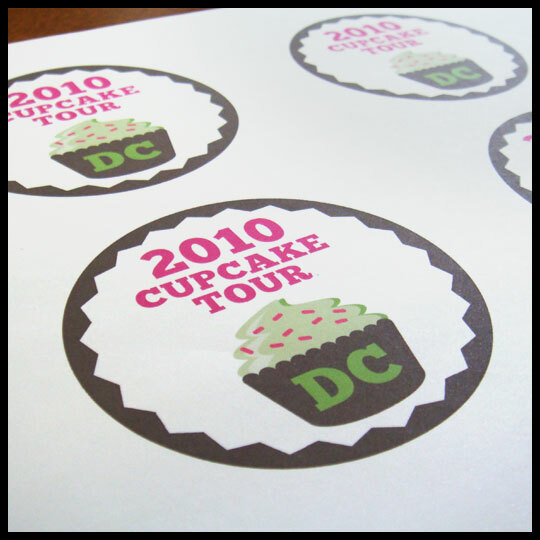 The Cupcake Crusaders are gearing up for their “2011 Annual Cupcake Tour.” Last year we went to DC, but this year we decided to stick to the outskirts of DC and will be hitting 4 stops (maybe 5) in the Bethesda, MD area. With our tour coming up this weekend, we thought we would share some photos of our DC tour from last year. Hope you enjoy! No tour is complete without a logo and a sticker. All the Crusader’s wore these during each stop. We got some funny looks, but that’s okay, it was all a part of the fun! 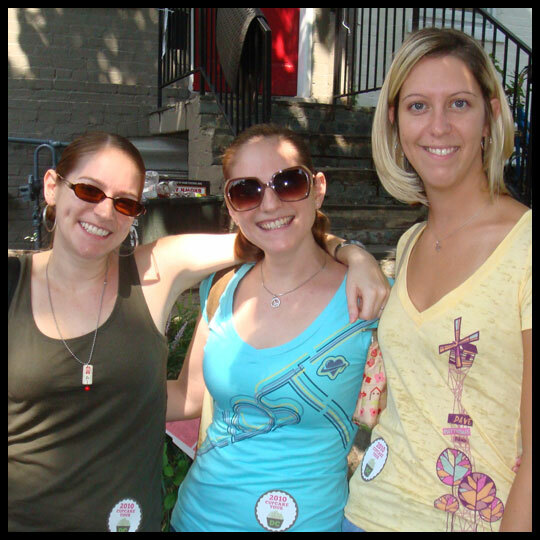 Here we are, sporting our nifty badges. 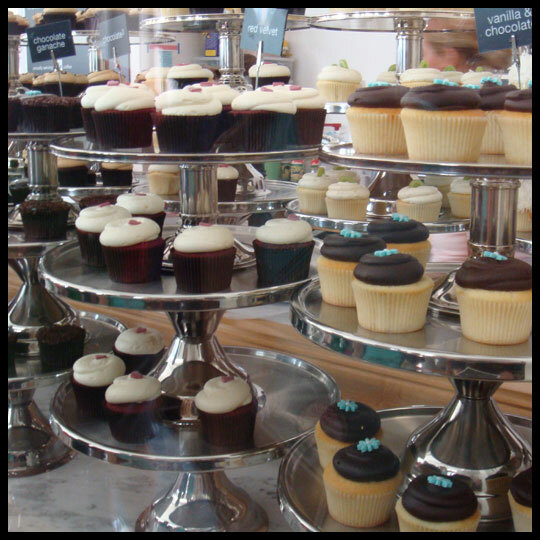 Our first stop was the well known Georgetown Cupcake from the TLC show, DC Cupcakes. 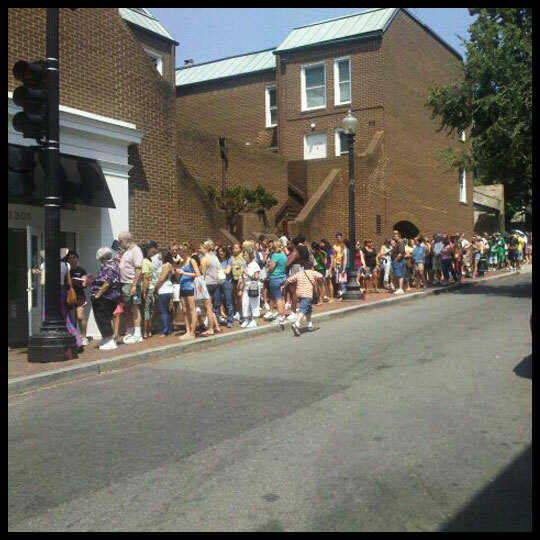 The line was totally worth the wait. Elisa and Stacy selected 2 Salted Caramels, 1 Mint Cookies N Creme, 2 Key Limes, and 1 Ginger Peach. The Salted Caramel is probably the best cupcake either of them has ever had. But their cupcakes were simple and pretty. 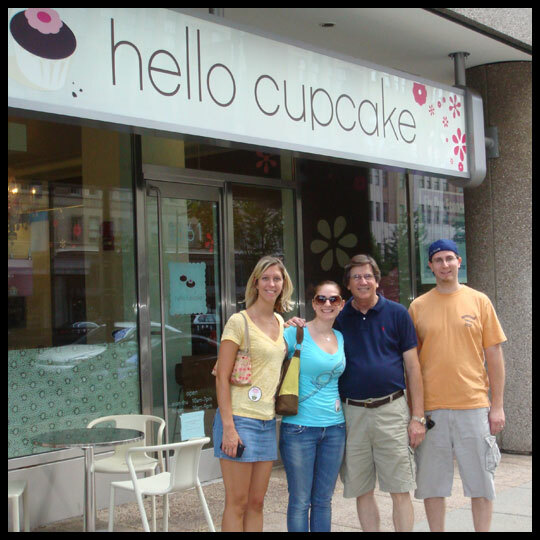 Final Stop: Hello Cupcake (Crusader Elisa, Crusader Jenn, Crusader Dad, and Jenn’s husband). 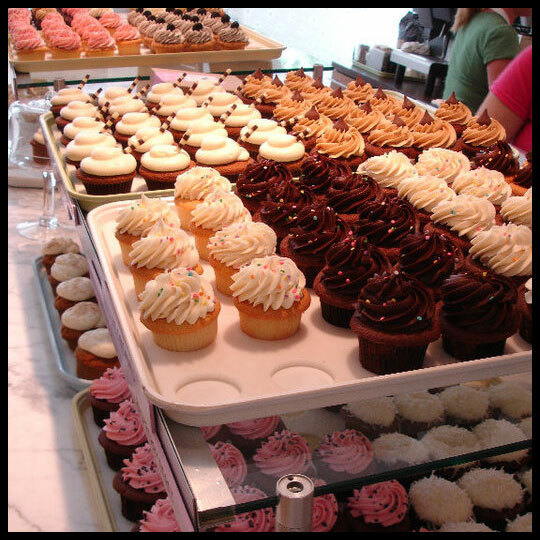 So many to choose from and we were almost “cupcaked out.” But it’s a good thing we pushed through because they have got some GREAT cupcakes! Crusader Jenn and her husband selected: Chocolate Peanut Butter, Root Beer Float, Chocolate Coconut, and Raspberry Coconut. Crusader Jenn’s husband thought that the Root Beer Float was his favorite of the whole day. Crusader Stacy selected a Yo Tart! Which is lemon cake and lemon frosting. She also got a lemonade… that’s a lot of lemon! Crusader Stacy decided to take a Peanut Butter Chocolate home and share with her husband. It was really good! During this last stop, owner and executive chef of Hello Cupcake, Penny Karas, came out and sat with us. It was such an awesome way to end our tour! Look out for that post next week!